The start for this race was a bit tricky with such a strong tide across the whole line and being able to approach the line on either port or starboard. Not a brilliant start but there or there abouts with the kite up reasonably quickly and 8 or 9 knots over the ground we settled down to a nice ride. We spent a bit of time trying to get through Chaser's lee but after twenty or so minutes of getting ahead, falling into the wind shadow and dropping back decided to chuck in the big luff and crossed her stern to get clear air. This worked and we slowly pulled ahead and now kept pace with the other Sigmas slightly ahead, Blazer and the 31.7s. Girolle caused some rapid manoeuvres from Alchemist and one of the Sigmas which gained us a bit on them. Gybing at NE Gurnard was thankfully uneventful and we all powered away to East Bramble. Rounding the mark we felt in a good position on handicap with the higher rating Sigmas, the 31.7s and Blazer all close by, Longue Pierre, Domaine and Polly's Kettle seemed long gone. We followed the majority up the beat to the East of the Bramble bank and with #3 and full main could easily see we were dropping off the pace. Blazer especially had drawn out a good few hundred yards and was eating up to weather like there was no tomorrow. Once at the East side of the bank we tacked and crossed to the Island feeling that from this position it would give the shortest crossing in the strong tide and get us into the Island by the back eddy off the Shrape. What a surprise as we closed theShrape to find Longue Pierre barely a hundred yards or so in front, Domaine had slipped behind us and we were back in amongst the Sigmas and neck and neck with Blazer. We seemed to have gained on both those that went early to the Island shore and on those that tacked along the Southern side of the Bramble bank further than we went. Then followed some interesting short tacking outside the moorings, a dive out into the tide to round Snowden and the beat to the finish line keeping in the back eddy. What a delight to finish amongst the Sigmas, just behind Blazer, in front of the 31.7s and well in sight of Longue Pierre. We felt we were on for a podium finish as we had not seen Polly's Kettle so didn't know her finish time. 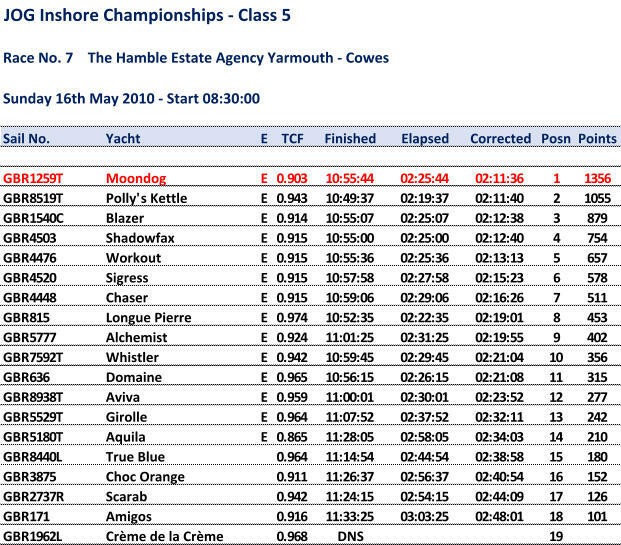 Great glee to find out we had another first place, commiserations to Polly's Kettle for beating her by just 4 seconds, roll on the Weymouth race.